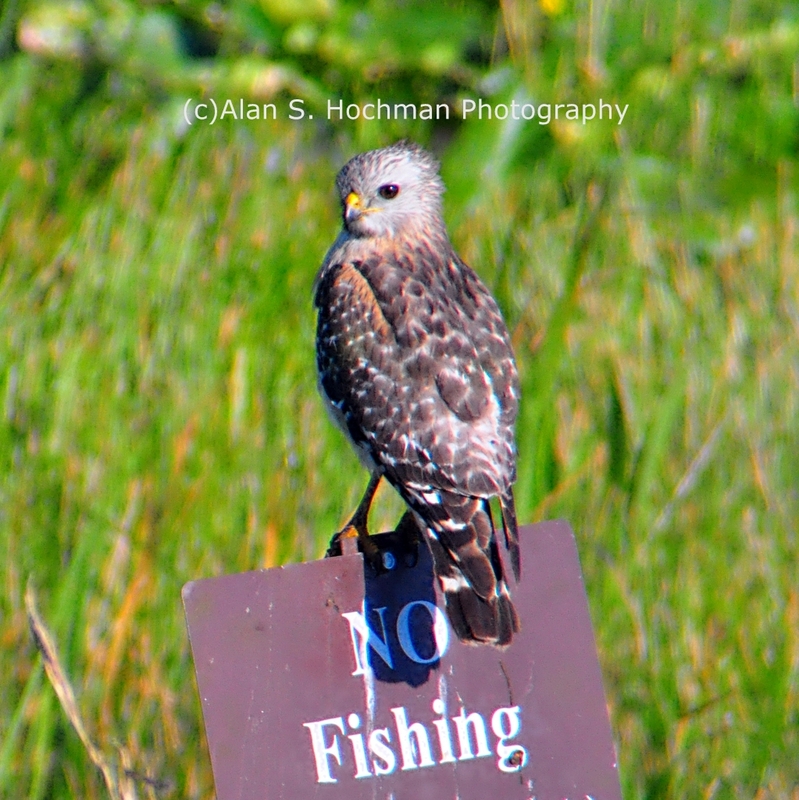 This photograph of an Hawk sitting on a NO FISHING sign was taken at the HoleyLand Wildlife Management Area off of US-27 (Okeechobee Road) at the juction of Broward and Palm Beach County. The gear used in this Hawk photo was a Nikon D90 camera body attached to a Tamron 28-300mm lens. One Sharp Bird: Hawks, as part of the group known as birds of prey, have acute eyesight, muscular legs and sharp bills. The nostrils are located just above the bill on a fleshy patch of skin that is called the cere. Hawks are known for their sharp talons, which they use to catch prey even when in flight. A Huge Family: Over 250 species are included in the hawk family. Hawks, like most birds of prey, hunt during the daytime, unlike owls. Small, Medium and Large: Hawks can be found in forests, prairies, marshlands or open savannas. The birds vary widely in size. The smallest hawks, such as the sparrow hawk, are about the size of a robin while the rough-legged hawk, one of the largest hawks, has a length of 22 inches and a wingspan of over 55 inches. Female hawks are almost always larger than males.